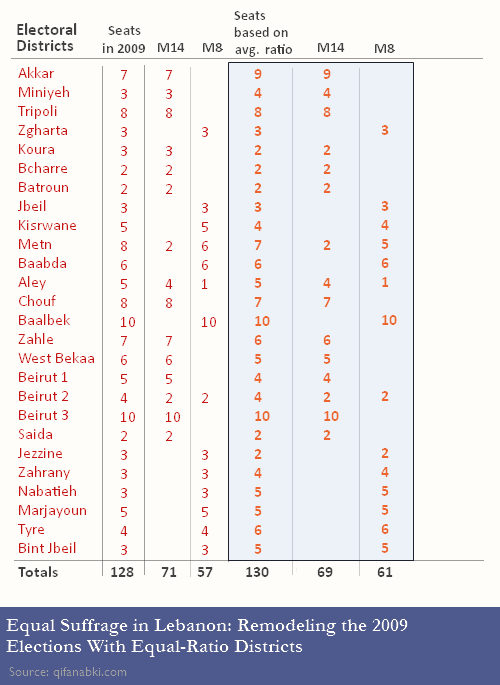 As most of us know, the ratio of voters to members of parliament varies across Lebanon’s electoral districts. This is a necessary byproduct of the need to square the mandatory confessional balance in Parliament with demographic realities on the ground. Article 24 of the Lebanese Constitution states that until such a time as a non-confessional electoral law is adopted, the distribution of seats in Parliament must give equal representation to Christians and Muslims. Obviously, in order to achieve this, you either have to give certain districts greater representation than others, or you have to let certain districts elect representatives who are not from the same sect as the majority of their constituents. This latter condition prevailed in the 2000 electoral law, where districts had a more uniform ratio of voters to representatives than the current law, but many Christians complained that the majority of Christian MPs were being elected on the lists of non-Christian heavyweights like Rafiq al-Hariri, Walid Jumblatt, Nabih Berri, etc. The question that I’d like to raise in this discussion is the following: What would happen to Lebanon’s electoral landscape in the context of a non-confessional electoral law AND a district map that was based on equal suffrage (i.e. the principle that every citizen’s vote should have the same value)? In my opinion, simply advocating the abolishment of confessional quotas doesn’t quite go far enough in producing a fairer system because a non-confessional Parliament based on the current geographical distribution of seats would still under-represent certain regions and over-represent others. Think about it: if someone living in Bint Jbeil feels that the current system discriminates against them because their vote counts less than the vote of someone living in the Shouf, how would their situation change if the confessional quotas in parliament were dropped BUT the same districts still elected the same number of MPs? The resident of Bint Jbeil’s vote would still count less than the resident of the Shouf. 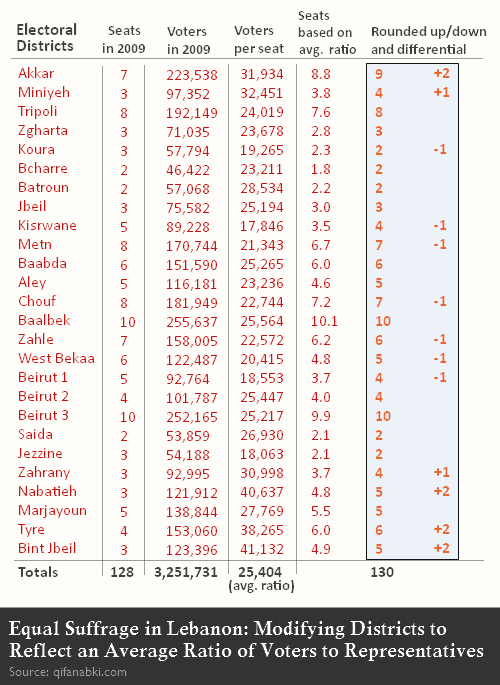 The first thing to do is to calculate an “ideal” ratio of voters to parliamentary seats by dividing the total number of registered voters in Lebanon (3,251,731) by the number of parliamentary seats (128), which gives us an ideal average ratio of 25,404 registered voters to each member of parliament. How does this ideal average ratio match up with the current electoral law? (Note that I’m not interested whatsoever in the issue of which sects get more or less than their fair share; I’m interested purely in which districts are over/under-represented). Click the table below to enlarge it. 1. Twelve districts have a ratio that conforms, more or less, to the ideal average ratio. These districts are: Tripoli, Zgharta, Bsharreh, Batroun, Jbeil, Baabda, Aley, Baalbek, Beirut 2, Beirut 3, Saida, and Marjayoun. 2. Eight districts have a ratio that over-represents them by one seat each: Koura, Kisrawan, Metn, Shouf, Zahleh, West Bekaa, Beirut 1, and Jezzine. 3. Six districts have a ratio that that under-represents them by a range of 1-2 seats: Akkar, Miniyeh-Dinniyeh, Zahrany, Nabatieh, Tyre, and Bint Jbeil. So far, this should not be very surprising. But wait, there’s more! The next question that I would like to ask is: what would have been the result of the last election had we had a system like this one in place, rather than the existing law? Obviously, this is very speculative, but it is not an entirely unreasonable exercise given that during the last election, every district (with the exception of the Metn) was swept by either the loyalist or opposition list. In other words, a majority voters in every district elected the whole slate of candidates presented to them, “zayy/mitl ma hiyyeh” (and in the case of Aley and Beirut 2, the mixed results were pre-arranged by the opposing sides ahead of time). This fact makes it easier for us to simply adjust the geographical distribution of seats to conform to the ideal average ratio described above, and then model the outcome of a hypothetical election using the 2009 returns. So, for example, we are assuming that if Nabatiyyeh had five seats rather than three in the last election, Hizbullah would almost certainly have won all five (because people voted overwhelmingly for their entire list), and if Kisrawan had four seats rather than five, the FPM would have won 4 instead of the 5 they won in 2009. Ok, so if we adjust the number of seats across all of these districts to conform to the ideal average ratio, and if we assume that the same parties/coalitions swept the same districts that they swept in 2009, the final result would seem to be that March 14 would have won 69 seats and March 8 would have won 61 (for a total of 130 seats; the readjustment of seats required an addition of two seats for the rounding-up math to work out). The new margin of victory is 53%-47%, rather than 55%-45% (as it was in 2009, when M14 won 71 seats and M8 won 57). So, obviously, the election would have been closer, but not by much. The March 14 coalition (such as it is) would still have won, a fact which surprised me, given what we know about the discrepancy between the popular vote and the actual results. Hizbullah and Amal would have benefited substantially to the tune of 7 extra seats because of the new math, but the March 8 Christians (Aoun and Frangieh, etc.) would have lost 3 seats (in Kisrawan, Metn, and Jezzine). Meanwhile, the Future Movement would have gained 3 seats in Akkar and Miniyeh-Diniyyeh, but various March 14 parties would have lost 5 seats in Koura, Shouf, Zahleh, West Bekaa, and Beirut 1. It seems to me that the takeaway conclusion from all of this is that: (a) current voter/representative ratios are not that out of whack with the ideal ratio; (b) even if we were to adjust the ratio (which I think we must do), it would not fundamentally change the basic landscape of Lebanese politics, which requires a lot of coalition building and inter-party (and, by extension, inter-sect) cooperation. Those of you who are still awake should feel free to pillory and critique! I’m confused. When you talk about “proportional representation”, are you actually talking of a single, nation-wide electoral district? Even the current system, if I am not mistaken, is a form of PR. There is no such thing as first-past-the-post or similar. The current system is first-past-the-post. Whoever gains a simple majority of the votes wins the seat. I understand that you recognize this, but your analysis shows that the districts themselves are distorted. I do think that the biggest advantage of proportional representation is that it provides smaller parties the opportunity to get representation, even if they can’t muster a majority. For dominant political factions, there’s not much to gain from proportional representation. Why would M8 prefer proportional representation to simple redistricting (for example)? they’d rather win a district outright with 50.1% than get 2/3rds the representation from some particular district. The problem, generally, with proportional representation is that it often provides minor parties with a disproportionate amount of influence. Such that, for example, a party with 5 seats can define the national agenda if the balance in parliament is otherwise close. I don’t think any particular voting formulation is going to solve the inherent conflcit and political stagnation in lebanon. Not that my opinion means anything, but my suggestion for political reforms, for the time being, would be to focus on issues of universal application. For example, a uniform ballot and transparent vote counting, restrictions on outside funding, provision of public financing of some type, advocating some type of referendum process to allow direct representation and other such reforms. Im not sure that going for deconfessionalized voting is the proper starting point (though a deconfessionalized legal framework could be, like the recent demonstration advocated). QN: This stuff is really, really interesting. Good job, and keep it coming! JOE M: The problem, generally, with proportional representation is that it often provides minor parties with a disproportionate amount of influence. Such that, for example, a party with 5 seats can define the national agenda if the balance in parliament is otherwise close. True, but… doesn’t Lebanon already have this problem? Check the seat distribution in the parliament now, and you’ll find plenty of small parties and individual MP:s who have cut deals to get in. unlike how I imagine a PR Lebanon. It hasn’t been hugely successful, coalition building isn’t pretty, and clearly the Israelis themselves aren’t too happy with how it works. But they’ve still managed to muddle through somehow for sixty years. It is note worthy that in a post on June 9 2009 I used the exact same methodology and arrived at the same conclusions. Let me take the opportunity here to add that the ideal set up would be to carve single seat districts each representative around 25,000 registered voters . I think that such districts will dissipate the power of the political feudal lords and that of the religious organizations. Smaller districts will encourage the representatives to get to know their constituents and is bound to deliver a more responsive democratic system. Could you give us a link to your post? Never mind: I found it. Interesting post. However, is this the solution to the country’s problems? It won’t make a bit of a difference in terms of fixing what is fundamentally wrong with the country. In his recent visit ot Brazil, Mr Suleiman sad that the diaspora right to vote is a solid thing. If that is true, and we have to register at the embassy to be able to vote we will be registered at Rio de Janeiro, São Paulo or Foz do Iguaçu or some other city the lebanese are spread in Brazil, it means that in your proposal the lebanese diaspora in Brazil would have a Seat at the parlament? i am curious about the numbers of ”registered voters” that you use. it seems to me that the population density of a district should drive representation-in any desired one person/one vote scenario. i.e populaton density should be the determinant in an absolute sense. voter registration or voter turnout are the ‘political’ manifestation of that, and both are usually expressions of the enthusiasm of the populace about candidates and issues. all that said, should we not encourage a nationwide census to obtain more accurate current population densities? (1) Assume the vote is finally approved as described above and keeping in mind the large area of Brazil how many of the Lebanese would be able to exercise such a right? (2) In your opinion do most of the Lebanese hold either a Lebanese passport or a Lebanese ID or are they just from Lebanese descent from say a 100 years ago? (3) Would the fact that most likely you r votes will be cast for a Lebanese list and not any special seats set aside for you make a big difference in the potential turnout? Thank you. I’m a brazilian lebanese, my grandparents were both lebanese, so was my father once he was born from a lebanese couple and the lebanese ancestry is passed by father’s blood and not by place of birth. So I got my citizenship, along with my sister and brother, and very soon my nephew. If the voting sistem is changed and PR is changed the way it is discussed here so there will be a seat for those living abroad, like they have in some european countries? The biggest immigration flux began 130 years ago (my grandparents holded a turkish passport that is why they call lebanese and syrians turcs in brazil) but it never stopped. During the civil war there was a important flux of lebanese immigrants ( not as big as to USA, Canada or Australia). But if I could get my citizenship, so it will not be difficult for others, and if it becomes legal to woman do the same, so many more can get theirs. Of course your are right about motivation, but given the right incentive and marketing, a skilled group can get people’s attention, work their motivation and maybe their vote. And believe me, our number is huge! But I hope that it will all be for the good sake of Lebanon. It is a interesting situation because if you consider the lebanese diaspora around the world, voting abroad could make a difference. What you have now is existing registered voters and some assume it will make no diference, but if people start getting their citizenship this number can grow enormously and the balance too. You might find this article on the mathematical “fairness” of various electoral systems interesting. That was a very well written summation of the major attributes/warts of each system. Thanks for bringing it up to everyones attention. Hmmm, in a sense Ghassan, accountability is quite a major issue in elections, particularly in a country like Lebanon. On the other hand my sense of fairness is seriously offended 🙂 when I look at countries like Canada and Britain where the seat allocation is barely related to the total vote distribution. In addition, it wouldn’t hurt to have parties fielding candidates all over the country and people voting on some political agendas (rather than mainly services). In any case my point is that a hybrid system much like Germany’s may be the best in combining the advantages of both first-past-the-post and proportional representation. My attraction to small districts is not due to the ease of asking for services but on the contrary the ease of asking that they deliver on promises made or explain stands that they have taken recently. I value the fact that I can nock on the office of a local state and even Congressional House Representative and have a serious policy discussion. This unfortunately is not the case with Senators because they have a constituency in the tens of millions at times. Yes a hybrid will be fine provided the districts are small and the representative can be held accountable. I hate the idea of hiding behind a decision taken by a party. what is your opinion on direct vote for president? I was so fascinated by the New Scientist article that I bought a copy today and I am glad that I did. When I read the article that you pointed to in your link I missed clicking on the links for the graphics. If anyone has a semi serious interest in election and fairness then I highly recommend this article in the New Scientist. It isn’t that it has many new ideas but it does demonstrate that practically all systems suffer of shortcomings, at least theoretical ones. Tnx again R.